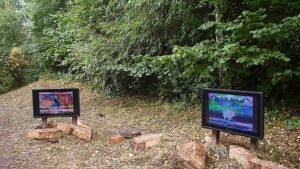 This ground-breaking exhibition that, uniquely enabled video art to be incorporated into an outdoor natural setting, was made possible by using state-of-the-art waterproof and weatherproof TV displays developed by Aqualite Oudoor. Wild New Territories is an exhibition showing new visual art, media and performance works that explore the interplay between the urban and the wild. The artists are a broad cross-section of award winning and emerging, artists from a variety of geo-political backgrounds in an unusually natural setting: Camley Street Natural Park in the middle of Kings Cross. Inhabited by hundreds of diverse species, not normally found in the middle of a concrete metropolis, these wild species will be joined by established artists including Gillian Wearing, Michael Landy, Kathy Kenny, Ron den Daas, Gordon Cheung, and American artist, Edgar Heap of Birds, working in a variety of challenging and site specific ways. “Wild New Territories” selected the best, affordable, high tech TV display panels with features especially adapted for conditions requiring weatherproof display. For many weeks, the monitors were able to withstand the rigors of England”s inclement weather conditions; unremitting rain, low temperatures, dirt, dust, fluids, and wildlife interventions! By using Auqualite”s cutting edge electronics, Wild New Territories was able to present video art outdoors in a truly original and novel exhibition context, in a manner that was relevant to the ecological themes of the show. “Wild New Territories” would like to thank Auqualite for their “wild new technology”, and their innovative support for our exhibition! This is a world touring exhibition premiering in London then moving to Vancouver, then Berlin. The London exhibition will take place from September 19th 2012 at Camley Street Natural Park (until October 31, 2012 12 Camley Street, London, N1C 4PW.